Dress up in costume and join in the fun! The parade will start from the Greater Ithaca Activities Center (GIAC) at 4:00pm and makes its way onto the Ithaca Commons. 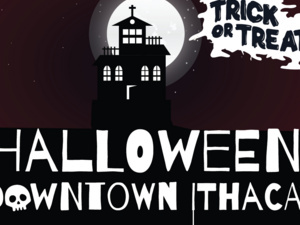 Trick-or-Treating and Halloween festivities will run 4:00 - 6:00PM. Stores participating in the festivities will have a "Trick-or-Treat" sign prominently displayed in their storefront window indicating that the store is greeting trick-or-treaters. Stores participating are located on the Commons, Aurora Street, Cayuga Street and inside Dewitt Mall. Enjoy music, free face painting, games, chili made by the GIAC Teen Catering Program, and cider inside Center Ithaca from 4:00 - 6:00PM. Areas around downtown include Ithaca Commons, DeWitt Mall, Cayuga Street, Aurora Street(Restaurant Row), Gateway Commons, Press Bay Alley, Cayuga & West State Street.